Welcome to the website of the Maryland Deaf Golfers Association. 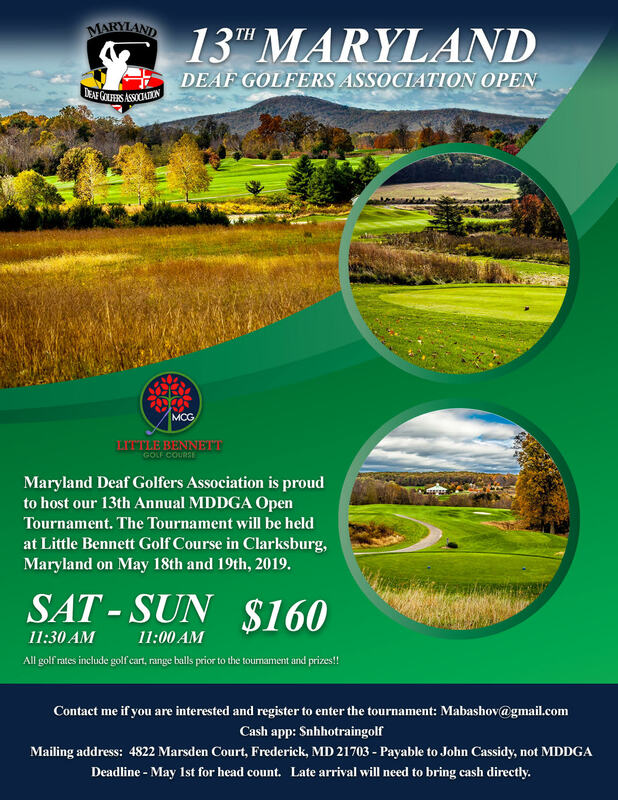 Maryland Deaf Golfers Association (MDDGA) shall promote interest and involvement in the game of golf among deaf and hard of hearing golfers. MDDGA shall sponsor local and regional golf tournaments for deaf participants, and host golf clinics for the deaf community. MDDGA shall be organized and operated exclusively for charitable and educational purpose. Our second event of 2019 will be held at Worthington Manor on (updated) Saturday April 20th at 1:30 PM. Five tee times have been reserved, please indicate your intention of playing by Friday April 19th 6 PM. Also, the MDDGA Open, hosted my Jerry Mabashov, will be held at May 18th and 19th at Little Bennet Golf Course. Click on MDDGA Open for more details. Copyright© MDDGA 2000-2019. All rights reserved.